The cold temperatures have headed out and the pollen has hit – it’s springtime in Atlanta! Now that Atlanta dog owners and their canine friends are ready to hit the great outdoors, where should they go? 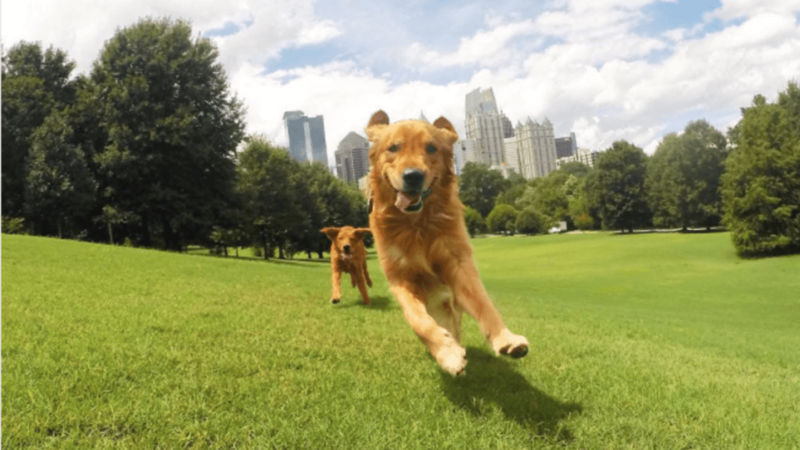 Atlanta is home to countless gorgeous parks and greenspaces, but which dog parks are the best for owners and their pals to frolic and play? We’ve compiled a list of some of Atlanta dog owners’ favorite spots. These parks feature expansive play areas, dog-friendly water features, and in some cases, fun perks for the owners as well. Dogs are welcome throughout Piedmont Park’s 200 acres, and many of the park’s fountains even have ground level basins for dog’s to use, but throughout most of the park they have to be on leash. That’s where the Piedmont Dog Park comes in. Since 2002, this special off-leash area has been one of the most popular features of Piedmont Park. Located on three acres in the northwest corner of the park, the Piedmont Dog Park features separate fenced areas for small and large dogs, trails, shaded areas, dog water features and restrooms for owners. On most weekends there are even concessions available from King of Pops, including their Dog Popsicles! Piedmont Dog Park – 502 Amsterdam Avenue, Atlanta, GA 30306. Open 6am – 11pm. Four acres in the rear of the 102-acre Brook Run Park are devoted to Dunwoody’s four-legged residents. There are separate large and small dog fenced areas, and since this is an urban woodland park, the tree canopy provides welcome shade on hot summer days, and protection against sudden rain showers. There are also two dogs-only water stations. Brook Run Dog Park – 4770 North Peachtree Road, Dunwoody, GA 30338. Hours vary, as the park is open daily sunrise to sunset. Looking for a dog park that is just as fun for humans as it is for dogs? ParkGrounds is a coffee shop with all-day breakfast and a field for dogs to roam around without a leash. Located just south of Inman Park in the Reynoldstown neighborhood, the gated dog area features shade trees and a covered patio for owner seating. Water bowls and faucets are provided for dog use, while owners enjoy coffee, sandwiches, beer and pastries. Freedom Barkway is located on over 2 acres in the Old Fourth Ward neighborhood, making it one of the largest off-leash areas in downtown Atlanta. The local neighborhood associations that run the park put on occasional dog friendly events, such as their annual Howloween Dog Festival. The park is still expanding, and future plans include a doggy splash pad area. If you’re near the Druid Hills neighborhood, the Mason Mill Dog Park is a local favorite. Shade is provided by picturesque dogwood trees and there are areas for small and large dogs to play. Dogs have a drinking fountain and plenty of toys. Mason Mill Dog Park – 1340 McConnell Drive, Decatur, GA 30033. Hours vary, as the park is open daily sunrise to sunset. Newtown Dream Dog Park isn’t just one of the best dog parks in Atlanta – it has been voted one of the top off leash areas in the nation! Located near the front entrance of Newtown Park in Johns Creek, the park includes a fenced one-acre area featuring artificial turf, sprinklers for dogs to play in, plus water fountains for people and pets, and a walking trail. There is even a doggy obstacle course with a bridge, hoops and tunnels. There are separate areas for large and small dogs, along with benches, shelters, and shade trees. Newtown Dream Dog Park – 3150 Old Alabama Road, Johns Creek, GA 30022. Open 8am-9pm. With so many options for dogs to play off leash, it’s no wonder Atlanta has been named one of the top 10 most dog friendly cities in the United States! You and your four-legged friends will love spending time in one of these great parks. And if you’re ready to move closer to the doggy action, search our listings here!